I have also been listening to "The Help" by Kathryn Stockett. It's so good - I can't stop listening! Ruthie looks fabulous, Nicole!! I love the colors. Isn't The Help excellent? I have been listening to it too. It is such a good book, and a great one to listen to rather than read. I'm a little confused (doesn't take a lot). Is this your original start on Ruth - the WIP you came across or your start in silks? Whatever it's looking great! Beautiful job! Those colors are just GORGEOUS!!! I'm loving this the more I see you work on it! Wow Ruthie looks beautiful!! I am so glad you had a nice Mother's Day! We also had a good weekend! I am hoping to stitch today. I think I may check on the book you are listening too. Sounds like you are really enjoying it!! The colors are perfect! I love the teal green, it really is something! Nice! I like the teal green! So are you using DMC now?? Looking good! 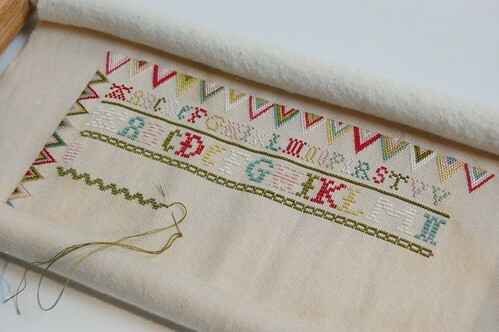 I can't believe how much you've stitched since the weekend. It looks amazing! Love the colors, too. I think they really "pop"! I really love the progress on Ruthie. The colors are just gorgeous and perfect! I just love those colors!!!! I thought all the versions looked good but the more you work on it, the prettier it gets! Love the colors-great job Nicole. I'm glad you had a nice Mother's Day! Beautiful stitching on Ruthie. The colours are just fab! Ruth looks great! Can I ask the color teal you changed too? I am in need of something similiar for a sally spencer (BOAF)sampler I am trying to convert. I'm enjoying the change of colors very much, Nicole! Your Ruthie progress is gorgeous, Nicole!! Third time's the charm alright! Although you know I would say everything you stitch look wonderful. Glad you had a lovely Mother's Day and it's so sweet your boys were so excited to surprise you. I will have to get The Help too after reading yours and Kellie's rave reviews. The lighter green does look good, Nicole. Glad you're much happier with it. Enjoy the rest of your stitching on it. You're a nut, Nicole! I can so relate though, so I'm a nut, too. Ruthie is stunning. I do love the colors you are using for this! I can't wait to see more. Glad that you had a great Mother's Day. I hear you though on the sleeping in part!